If want to introduce a little lady in your life to the absolute joys and wonders of makeup, Real Her is the way to go. It’s also intergenerational and suitable for seasoned makeup vets. Not only are the kits and colors absolutely user-friendly and beautiful, but there’s also a charity element. The brand donates 20 percent of the gross profits to AAUW, an organization that advances the idea of equity for women and girls through scholarship programs, leadership, advocacy, education, and research. The brand was also started by a father who wanted to teach his daughter about products and how to use them with confidence in her own beauty. 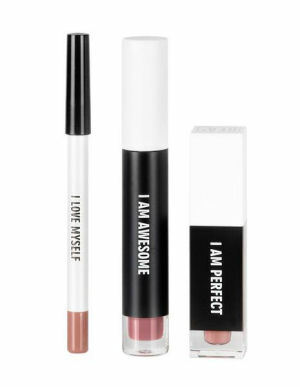 The I Am Awesome lippie trio — a matte liquid lippie that is feather light and never cakes, along with a smooth, no-skip liner, and a matching gloss — is all you need this summer. Real Her invites you and your daughter to discover makeup together. Not only are the colors appropriate, but the packaging boasts inspirational, confidence-building sayings, like “I Am Awesome” “I Am Ambitious” and “Women Run the World”. Screw those airbrushed, model-driven makeup adverts featuring unattainable and self-esteem-smashing beauty standards. Real Her creates wearable products for girls IRL…ones that mom, big sis, or aunt will borrow and use. The products are also of ace quality. So it’s the best of all worlds.